The first challenge with the J&M and BikeMP3 digital music players was to populate an SD memory card or USB thumb drive with music. With a large selection of music to choose from, I found it time consuming to (1) choose songs, (2) organize them into each of the 10 CDs, (3) sort or randomize the order they play in and (4) make sure there were only 99 or fewer songs per CD. Earlier Players -- The JMDM-GL18 and BikeMP3 V1 and V2 plays the music in the order the songs are loaded into the SD memory card, copying a block of songs and dumping them on the SD memory card doesn’t quite work the way you want. Microsoft has a way of sorting by file title or date during the load. New for 2011 -- The new Bike MP3 V3 player released in February plays the song tracks sorted alphabetically in up to 10 folders, depending on what year GoldWing you have. The player also solves many of the hardware problems experienced with earlier J&M and BikeMP3 versions. The challenge was to provide a software tool that played the music in the specific order that the user wanted to listen to the music, either sorted by title, artist, album, genre or random play order. The software tool takes care of the load order with the use of a "randomize" button for scrambling the order of the songs. This new software tool allows one to find all of the MP3/WMA songs on their hard drive and provides an easy method for organizing and loading the 10 virtual CDs. The tool limits each CD to to a user-selected maximum number (99 for later year GoldWings) songs and allows you to add, move and delete songs according to what you want to listen to. The tool only contains and manipulates a song catalog / list, so nothing is ever actually touched on the source hard drive. Once the music lists have been completed on any given CD, the user can choose to optionally randomize, manually reorder or sort the song order again if needed. For the final step, a simple drop-down menu is selected and the songs are copied from your hard drive to the USB Thumb drive or SD memory card. This is the only time the music files are actually accessed by the tool. If any song file already exists on the target memory chip it will not be re-copied over. Afterward you can save the configuration so that the process can be modified and repeated at a later date. I find that having access to 990 songs is more music than I can ever listen to in a single month of riding. The rebuilding of the list is now a simple task and allows me to want to change it more frequently than if I had to use Excel or manually build the list. On my hard drive I have over 10,000 songs. 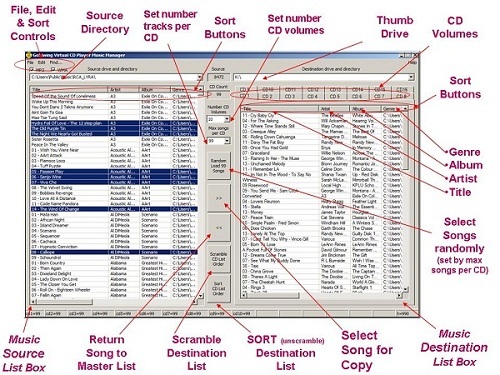 The software easily finds, organizes, randomizes and stores exactly 99 songs on each of the 10 CD volumes. It only takes about 30 seconds to create a new SD/Thumb drive version from scratch. We also tried the software tool on the 2gb microSD memory chip used in my wife’s Samsung phone and quickly added 300 songs to her phone. Since her phone’s music player supports random play order of music, we didn’t need to scramble the music prior to loading songs into her phone. She's a happy camper now. New Laptop Software Version -- The software package comes with an additional version sized for smaller laptop screens sized for 800x600 resolution. When you install the software, you will see two icons on the screen for each version. This product is not produced by J&M. The software is of a generic MP3/WMA music player design with multiple applications developed by an independent software developer.